The 34 metre motor yacht Frivolous has had a central agency change and is now jointly listed for sale by Matthew Stanton at Sunseeker Monaco withBurgess. Designed by Don Shead and built in GRP by UK yard Sunseeker International, Frivolous was delivered in 2009 with a refit in 2016. She has a gorgeous interior in rich gloss cherry wood and is fitted with a Bang & Olufsen audio visual system throughout. A large saloon has comfortable seating on two settees and has an entertainment centre including a 55-inch Samsung LCD television screen and there is a formal dining area for 10 guests. Accommodation on this yacht for sale is for 10 guests in five cabins consisting of a master suite forward on the main deck with a shower and a Jacuzzi while below are two doubles and two twins, all with entertainment centres, television screens and en-suite bathroom facilities. In addition, five crew members are accommodated in three cabins. The aft deck is sheltered by the overhang flybridge and offers an ideal spot for pre-dinner cocktails while the flybridge itself is perfectly equipped for al fresco enjoyment with a Jacuzzi, dining table, bar and a hard top with a retractable electric canopy. Further features include a hydraulic swim platform and Trac digital fin zero speed stabilisers. 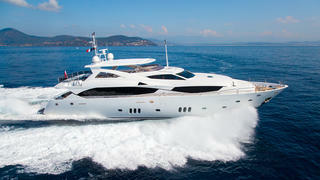 Powered by twin 2,434hp MTU engines, she has a cruising speed of 16 knots, topping out at 24 knots. Lying in Sardinia, Italy, Frivolous is asking £4,250,000 with tax paid.